It’s that time of year again - many of us get swept up in the holidays and the gift giving/receiving tradition. Very often the intention to have a more minimal holiday gets lost in the last minute rush to get everything done. Too soon, the holidays are over and you’ve (1) spent more than you intended (2) have way too many gifts you don’t need and (3) you’re burnt out from running around between shopping and holiday parties. It’s important to understand how habits are formed so they you can change them successfully. Approximately 95% (find credible reference to link) of our daily behaviours are run via our subconscious brain. This is necessary to function, but also means that the short-term and long-term habits we develop are very challenging to change. Habits follow what’s called a “habit loop”. First we have a cue. (It’s December or earlier, and we see decorations in stores). Next, the routine. (We begin shopping and buying for those on our list). Lastly, the reward. (Knowing that you have something for that person on your list). What keeps this loop going is a craving. For some, that craving could be the retail therapy from shopping, filling the need to buy due to family/friend pressure and cultural norms, or finishing shopping before a holiday. Once that loop is repeated often enough the routine becomes a habit, and often occurs subconsciously/automatically. To break or change a habit you need to replace the routine with something else enough times that a new habit is formed. Cues, rewards and cravings will vary from person to person. If you want to change your habit you need to actually know what your triggers are! Here are four scenarios you may find familiar, with habit changing tips! Scenario: It’s the first week of December and you still have to buy gifts for family, friends and/or co-workers. Time is ticking -- what do you do? Cue: You notice the stores are filling up with holiday decor and the holiday party invitations start rolling in. Old Routine: Visit a shopping area and hunt for random things that remind you of the people you’re shopping for. Maybe you end up with a gift you’re not sure the recipient will love, but at least you have something. Before you start shopping, brainstorm your goals for holiday gifts. What habits do you want to change? Make a chart with three columns so you have your plan written down. One column for name, the second column for their interests and needs and the last column for what you can get them. Ie. Tanjot. Interests and needs are: rock climbing and wanting to try out a new rock climbing gym. Gift idea could be a day pass to the new gym that both of us can enjoy. pitching in with other friends or family members to get a larger item that is actually needed. Possible Reward: You created a plan, followed through and you feel fulfilled for doing things different and achieving your goals! You are more relaxed and rested than last year, and you know that the people receiving your gifts will use and truly appreciate them. Possible New Craving: Wanting to do it again next year and start earlier because of the great success! Scenario: One of the biggest problems with running on automatic is the waste that accumulates with holidays gifts and parties. One way to avoid this problem is to look at buying consumables from specialty local shops. This was you are giving something special that someone may not have purchased otherwise.What do you do when you get a gift you don’t really want or need? How can you change this habit without feeling guilty or afraid you will offend someone? Cue: Holidays are coming up. Old Routine: You receive a gift that you immediately know you don’t need or want. You know the gifters intentions were kind, so you awkwardly tell them you appreciate it or love it. Even though you know you won’t use it, you feel like you have to keep it in case they come over and ask where it is or ask you if you have used it when you see them again. Make a list of 2 or 3 ways you can communicate your new needs for a clutter free holiday. “I appreciate all the time and energy you put into the […] you got me last year. This year I would love if you [contributed to ______ non-for-profit, we went somewhere together like the theatre, or money towards a larger item you need]. A month or two before the holidays make a point to have a conversation with those you want to let them know about the new habits you’re working on. Possible Reward: Feeling free from guilt because you didn’t receive unwanted gifts. Not having things you don’t want or need. Possible Craving: Wanting to try it again with more people the following year and with other celebrations like birthdays! It’s also satisfying to feel like the things you were given (i.e. experiences, practical needs and wants) have a cherished, useful place in your life. Keep in mind you may still get the odd gift that doesn’t check any of your boxes, but for starters, make sure that you communicate to the people you are close to and feel comfortable with. Scenario: One of the biggest problems with running on automatic is the waste that accumulates with holidays gifts and parties. One way to avoid this problem is to look at buying consumables from specialty local shops. This was you are giving something special that someone may not have purchased otherwise.Time spent on shopping, running errands, attending events (that you may not want to go to! ), and preparing presents can be overwhelming in an already busy life. There are always ways do things faster, however like the other habit changing examples, it’s important to reflect and see what’s most important to you. This reflection will help you realize what’s not necessary for you to do, and make it easier to say no. Cue: You’re feeling the holiday madness coming on. You’re schedule is getting more and more full. Old Routine: You haven’t seen a friend in ages and you feel obligated to attend their event. You rush around looking for gifts to bring to holiday parties on your lunch break and after work. Your family is asking for you to take off more time to spend with them. You’ve booked holiday lunches and dinners that fill up the free time in your work week. By the time the holidays are over, you are completely mentally exhausted. Make a list of yearly holiday events you go to. Rank them in order of importance to you. What events would you feel comfortable missing this year? And now - yes, cut the list down. What’s the worst thing that can happen if you don’t make one of your events this particular year? Also consider alternating years you go to different events. Possible Reward: More time to enjoy the holidays without feeling stressed and double booking yourself. You end up enjoying events more and being more present when you don’t have a crammed holiday schedule. Possible Craving: Find more ways next year to save time and do what matters the most. Scenario: One of the biggest problems with running on automatic is the waste that accumulates with holidays gifts and parties. One way to avoid this problem is to look at buying consumables from specialty local shops. This was you are giving something special that someone may not have purchased otherwise. Cue: You start your holiday shopping. Old Routine: You’re running low on time and pay to have some gifts wrapped in the store you purchased them at. They go all out with bows, wrapping paper, and ribbon. With your remaining gifts you notice how much packaging all the items come in for such small items. New Possible Routine: Set time aside to look for new reusable/sustainable gift wrapping supplies. Do some research and check out pinterest or Instagram for inspiration. 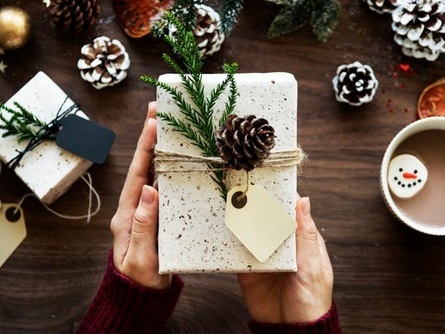 Take a look at the list of gifts you’re purchasing and, for each, choose how you will wrap them in a more sustainable fashion! Possible Reward: Spending less on wrapping paper and knowing you’ve created less waste. Possible Craving: Wanting to find even more ways to do this next year and show others! Want to learn more about habit changing? Check out a summary of The Power of Habit by Charles Duhigg or read the book, Breaking the Habit of Being Yourself By Dr. Joe Dispenza for some more inspiration!